Sunuwar Udhauli at Nakhipot, Lalitpur, Nepal. 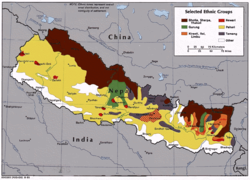 Selected ethnic groups of Nepal: Kiranti, Sunuwar, Limbu, Rai, Yakha, Sunuwar. The Sunuwar (Nepali: मुलबासी, कोइँच, सुनुवार; Sunuwār Jāti) is an indigenous tribe from the Indian subcontinent, mainly modern-day Nepal and present-day India. They speak the Sunuwar language. According to the 2001 census of Nepal, 17% of the tribe follow the Kirant religion and adopt the Mundhum (Kiranti) culture. The Kiranti-Kõinchs number 55,752. The term ‘Kõinchs’ is also the name of the mother tongue. Other terms like Mukhiya or Mukhia are exonyms of the tribe. Sunuwar have their distinct language, religion, culture and social customs. They inhabit the eastern hills of Nepal and Himalayan India. They are concentrated along the Molung Khola, Likhu Khola and Khimti Khola (‘Khola’ Indo-Aryan Nepali etymon ‘rivulet’) regions. By administrative division, they dwell in Okhaldhunga, Ramechhap and Dolakha districts of Nepal, politically known as Wallo (‘Near/Hither’), Kirant (in the past and also in use among the Kirantis at present) after the fall of the Kirant dynasty (ruling for about 1903 years and 8 months) at the ancient Nepal valley. Wallo Kirant in the past was their Kipat or communal land. Most Sunuwar practice agriculture (approximately 55%). They do so throughout the eastern hills of present-day Nepal and India. Crop cultivation and cattle farming (rice, millet, wheat, soybean, potato, and corn) are the main agricultural works. Sunuwar people also took part in the Second World War and were known as Gorkhali fighters, as well as honest. Some Sunuwar still join the Nepal Army, Indian Army, Singapore Police Force and British Army. Sunuwar are very rich in culture and traditions. They have hundreds of traditional feasts and festivals with complex rituals and rules. Every traditional feast or festival has its own objectives, characteristics, and system of celebration. Some festivals, such as Chandi Dance in Baisakh Purnima, Sakela (Shyadar-Pidar), Gil puja (Gil-Pidar), and Meserani puja (Meserani-Pidar), are considered more important than others. They celebrate the Shyadar-pidar festival on the Day of Buddha Purnima, or after 5 days of Buddha Purnima(Panchami) according to the Nepali calendar. Sunuwar New year is celebrated on the day of Basanta Panchami. As a community, they celebrate Meserani Pidar twice a year, based on the Lunar Calendar. ^ "Central Bureau of Statistics". Cbs.gov.np. Retrieved 2017-07-01. ^ "Sunuwar.org". Sunuwar.org. Retrieved 2017-07-01. ^ "Sunuwar Samaj Hong Kong". Sunuwarsamajhk.org. 2011-09-23. Retrieved 2017-07-01. ^ "Sunuwar Dress - Home". Facebook. Retrieved 2017-07-01. ^ "Sunuwar: Sunuwar". Sunuwardurga.blogspot.com. Retrieved 2017-07-01.